Besides the Project Steering Team chairperson, another very key role on the team is the project manager. 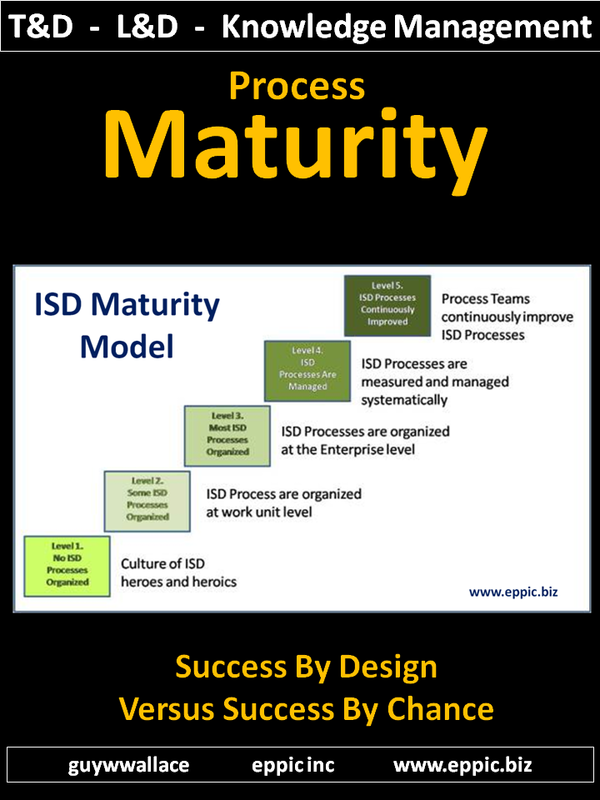 The role of the project manager is to manage the interaction between the customer organization and ISD professionals. For example, the project manager helps an analyst get in touch with the right people to find out about the nature of the jobs targeted for study. In addition, the project manager contacts all team members to inform them of their participation and roles in the project. It’s up to the project manager to plan well, communicate the plan, and sell the plan. This keeps everyone on the same wavelength, with common goals and expectations. One person may fill the role of project manager. However, in certain projects, it makes sense to have two individuals in this role, one from the customer organization and one from the supplier (ISD) organization. 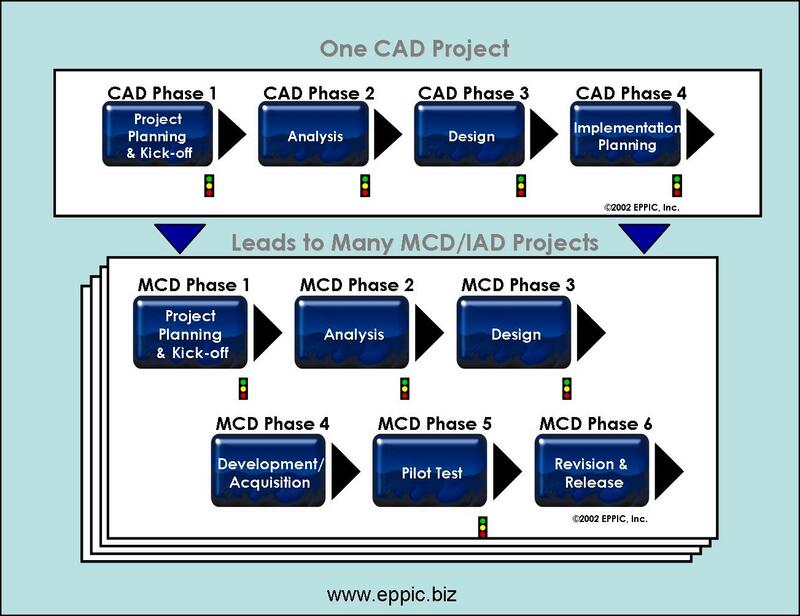 In any event – the Project Planner/Manager develops the plan for the CAD effort and then manages the effort through the 4 Phases – unless the phases have been reconfigured in some manner. The Analysis Team is used to define performance requirements and enabling knowledge and skills. Provide input in analysis meetings regarding the missions, key outputs and metrics, tasks, and roles and responsibilities of ideal performance. Provide input in the analysis meetings regarding the typical gaps in performance (outputs not meeting targeted metrics), likely causes of the gaps, and an assessment of the causes’ root source being due to deficiencies in the environment, knowledge/skills/competencies, or physical and/or psychological attributes (see Chapter 23 for more information on these deficiencies). This team is composed of members who can articulate the performance requirements of the job, task, or process. Collectively, team members will know all of the key enabling knowledge and skills. They are themselves master performers or, minimally, subject matter experts. Others who might make good Analysis Team members, depending on the situation, include managers and supervisors of the target audiences, and sometimes even novice performers. 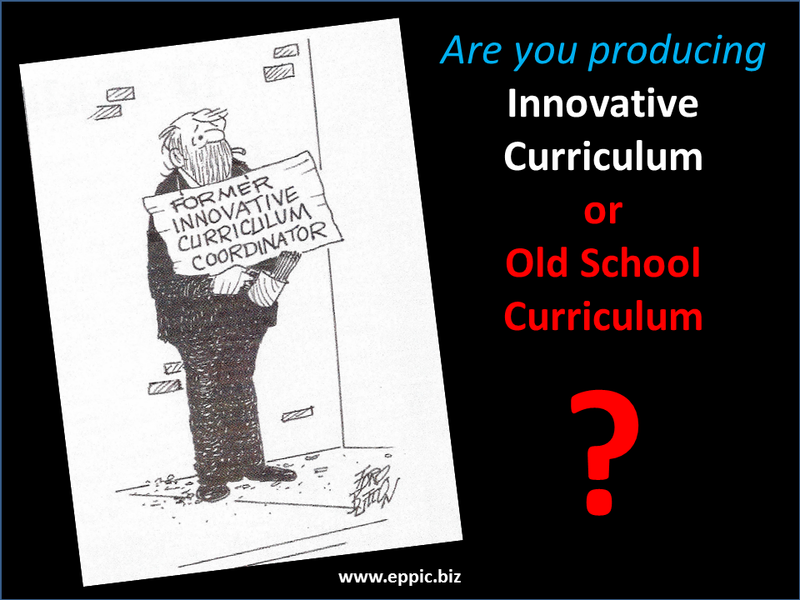 Individual master performers are known for their current expertise in today’s performance situation (not the knowledge they had three years ago before they took a headquarters staff job!). They have good reputations and are credible with their management and peers. They are often called upon to help others in the organization get out of trouble. They are often peer coaches for the organizations’ novices. They usually have strong egos and strong personalities, and facilitating them can often be quite a challenge for ISD staff. If there are any limitations on who can be involved in the analysis process, choose these master performers! We benchmark them during the analysis process. Subject matter experts are people who know a great deal about the job or some relevant issue, procedure, policy, tool, or problem. 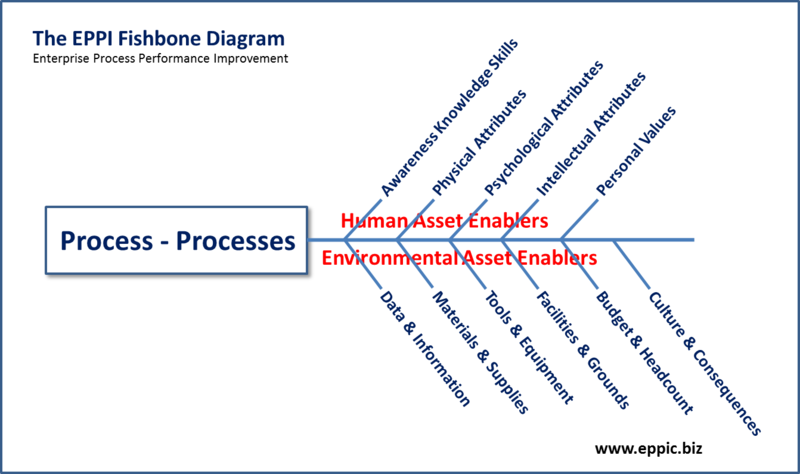 Subject matter experts may be knowledgeable about some aspect of performance or all of it; however, by the PACT definition they are not master performers unless they are currently performing a task to a level of mastery recognized by their own organization. Subject matter experts may not know how to get a job done when faced with today’s real-world barriers and issues or how to work around or plow right through. Manager and supervisor representatives are sometimes important. They often have the big picture when master performers and SMEs don’t. For example, sometimes the near-term future state is being designed just one step ahead of the real work, and very few people may understand what’s ahead in the future. (This is often the result of past managerial practices of keeping most people in the dark, inadvertently or deliberately.) In any event, managers and supervisors are often placed in the PACT Processes and even deliberately invited to act as spies on behalf of the Project Steering Team. Including novice performers is sometimes appropriate to the situation. While master performers are important because they have years of experience and understand the intricacies of performing the tasks on a daily basis, novice performers are important to the team because learning the job tasks has been a relatively recent experience to them. Novice performers can identify critical sequencing, tasks, steps, and other information that is important in the eventual training; more experienced performers might take these aspects of the job for granted. Novice performers know which immediate survival skills are critical! If the focus of the project is on T&D for predominantly new hires, inclusion of these people may be especially useful. Getting the right people into the right teams or roles is critical, but even if there are one or two ringers (people with really no business being involved except as political hacks), having a preponderance of the really right people balances everything out acceptably. It is important to create an Analysis Team of diverse participants. Different folks add different perspectives to the analysis effort. 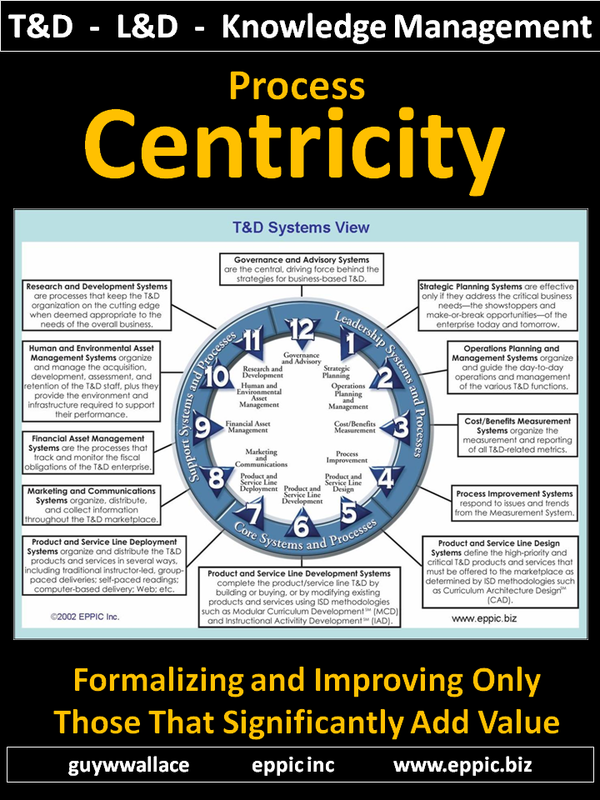 The Analysis Team ensures that real-world work performance, as documented in the Performance Model, becomes the ultimate criterion for the T&D’s learning objectives. It also ensures that all additional analysis data, such as enabling knowledge and skills, is based on the Performance Model’s description of ideal performance. The Design Team is typically responsible for providing input in the design meeting regarding key content points, typical issues, level of detail required, estimates of time and length, and potential sources for the information. In line with the saying that “The T&D customer owns the content, and the T&D supplier owns the process,” the Design Team is asked to contribute live, as they see the T&D design unfold before their eyes. This is not design by committee; the Design Team does not do the design while the ISD practitioner sits and watches and writes. Rather, this is influencing the designer by committee; the designer designs T&D based on the analysis work products, doing that while Design Team members observe, critique, and contribute―live and on the spot. Be concrete thinkers as well as conceptual thinkers. 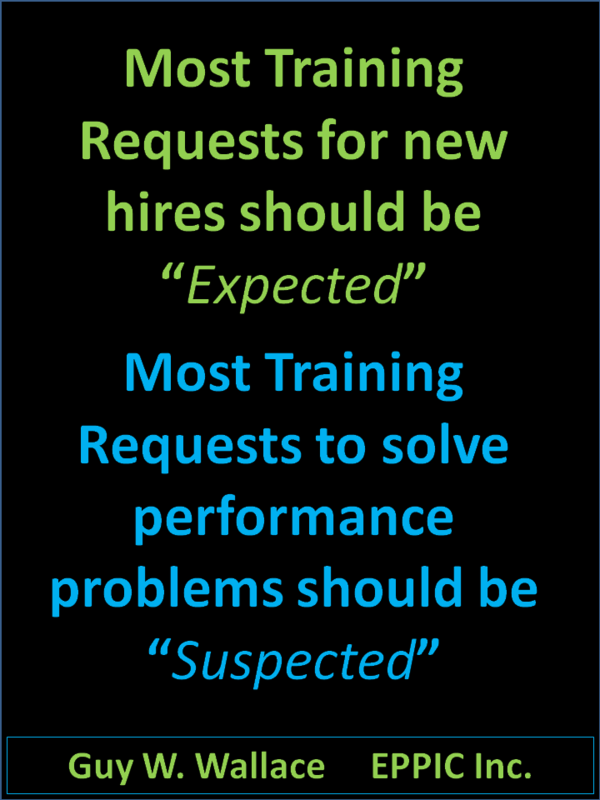 Understand job performance and knowledge/skill requirements even better than Analysis Team members do. Down-selecting Design Team members from the Analysis Team is a critical step. During the Analysis Team Meeting, the project manager and analyst get a chance to see the personalities and styles of each member. That’s when and how ISD professionals identify the best candidates for the next steps. Why doesn’t the project manager want new members on the Design Team? Analysis Team members have collectively worked their way through many decisions on job breakdowns, tasks, outputs, and so forth; they have organized the analysis data and should be comfortable and familiar with their organization. 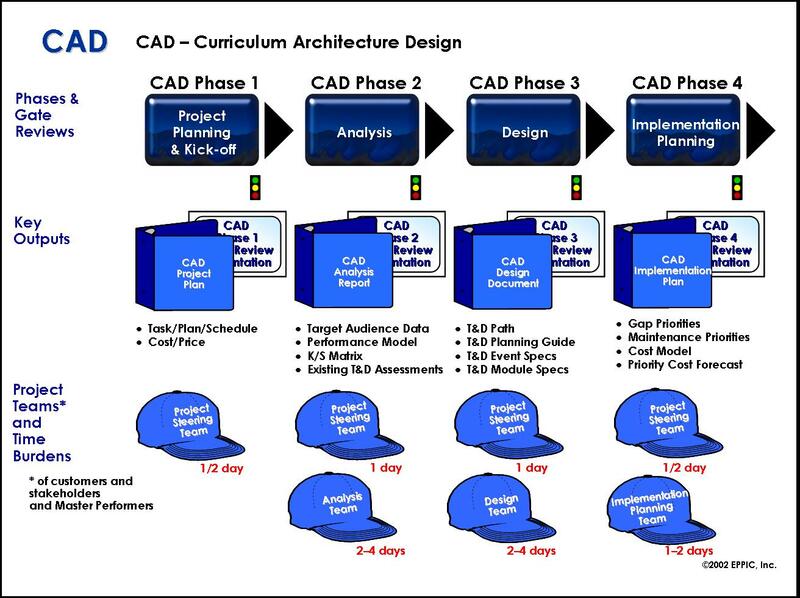 New members struggle with this organization; they may feel the need to “fix” the analysis data before they can go ahead with the design process. Not only does this slow down the design process, it also makes the “old” Design Team members―the ones who served on the Analysis Team―upset because some newcomer is messing with “their” data. During the Design Phase, the project manager can sometimes deflect a potential new member to a position on a Design Review Team rather than the Design Team. But if it’s absolutely necessary to add a new member to the Design Team, the project manager must make sure the new member becomes thoroughly familiar with the analysis data and its organization. This means walking the new member through the analysis outputs step by step, detail by detail, and enlightening him or her to how this data will be used downstream. The Implementation Planning Team is unique to Curriculum Architecture Design projects. This team accomplishes two critical tasks (unless the Project Steering Team decides to do them). After the Implementation Planning Team votes priorities, the priorities are loaded into a spreadsheet. The development ratios are then applied to determine how many development dollars are required for various levels of T&D development. The dollar estimates allow the Project Steering Team to decide later whether or not the resources available are sufficient to the needs of the business. The Implementation Planning Team is typically composed of members representing key stakeholders. But unlike most Project Steering Team members, they may be closer to the action than the higher-level individuals sought for most Project Steering Teams. Members can come from the Project Steering Team, Analysis Team, or Design Team. Even new players from new organizations might be welcomed in this particular team. For example, imagine a representative of the finance department becoming involved, a representative who can later attest to the sanity and logic of cost estimates that can, in some cases, grow to be quite large! 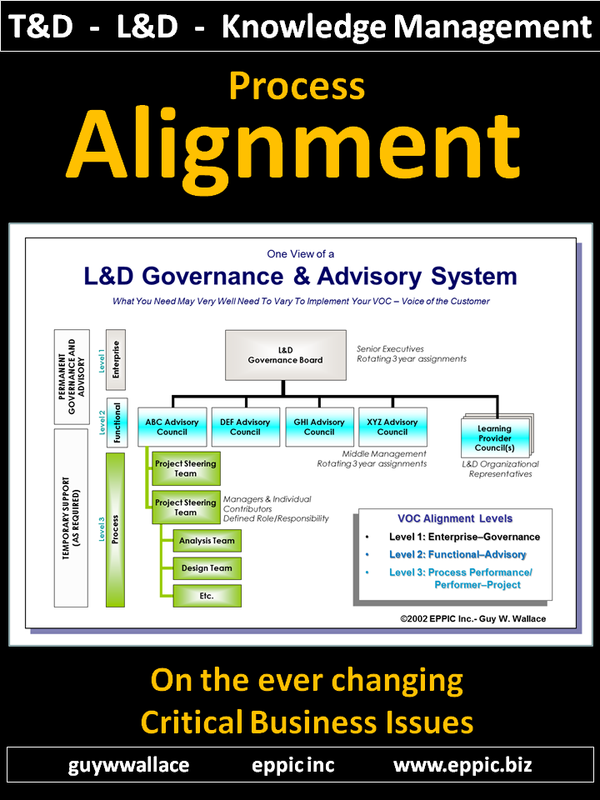 In essence, what the Implementation Planning Team does is to plan the organization’s portfolio of T&D―helping separate the T&D that should be from the T&D that could be. 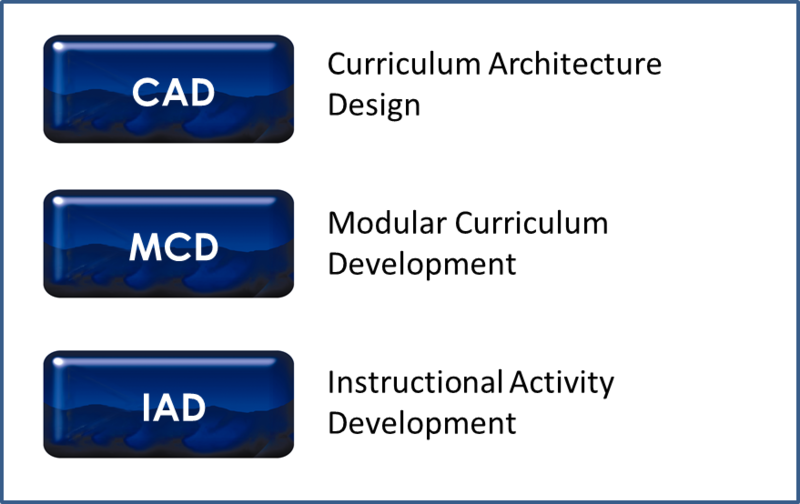 In the next Post I’ll cover the teams in an MCD – Modular Curriculum effort. MCD is the PACT version of ADDIE or SAT.